Britain’s best stand up paddleboarders will head for Watergate Bay, North Cornwall this autumn to compete for the title of National SUP Wave Champion. Hosted by the Extreme Academy, the fifth British Stand Up Paddleboard Association (BSUPA) National Championships will take place over the weekend of 4 to 6 October and will attract competitors from around the country. Stand up paddle (SUP) boarding has been described as a cross between canoeing and surfing. Riders stand up on a large style of surfboard and use a single bladed paddle to steer, turn and propel themselves through the water and onto waves. 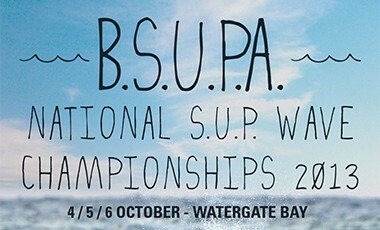 BSUPA event director Richard Marsh said: “There’s a great buzz surrounding this event as BSUPA has taken a bold move to make it a SUP Wave only discipline event for the first time. Last year we had 55 entries and with the conditions as challenging as they were, it was quite tense whether we’d actually finish in time. Solely focusing on the wave element of SUPing will give us more flexibility. “This year’s competition is wide open. Whilst there are names we know, there’s a very strong chance that someone unknown could tear apart the fleet and take the championship. It will definitely be quite a show for spectators.” The national championships will comprise of four categories: open men, open women, U16 youth boys and U16 youth girls. With autumn swells predicted to hit the Cornish coast, conditions could see waves of up to 6ft. Competitors will be judged on their style and how they ride the waves much like a surfing competition but with scores taking into account how surfers make use of the paddle. Watergate Bay Hotel’s Will Ashworth said: “It is amazing to see how SUPing has grown over the last few years. We’ve certainly noticed a bigger interest in the sport at the Extreme Academy. To find out more information about BSUPA visit: www.bsupa.org.uk.